Pitcher Bob Lacey needed just one day to be a huge part of history. A surprise starter on Oct. 4, 1980, he blanked the Brewers on seven hits. The game was a day of firsts. With thanks to http://www.retrosheet.org/, here’s the chance to relive what 9,116 in County Stadium witnessed. “That particular game that I started against the Brewers was my first start and complete game shutout. The game set the (team) mark with 94 (complete games) for the 1980 season. In the fifth, Paul Molitor hit a lined pea which Rickey (Henderson) picked up on a short hop to gun down Jim Gantner at the plate. What a great play. Notice that Lacey didn’t feel the need to add “Henderson” to his recap? As if baseball had any other Rickey who mattered in 1980? Lacey led the league with 74 appearances in 1978. His actual workload was much more. My last question revolved around his second career: school teaching. How rare is it for a former player to become an educator? Likewise, how does a student deal with the amazement of knowing that the teacher used to be a sports celebrity? “Jim Cox and Larvell Blanks are both teachers that I see from time to time. 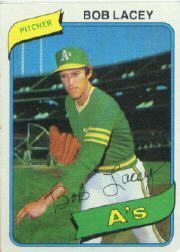 Kudos to the 1980 Topps Baseball Blog for a fine account of Lacey’s personality-filled Oakland years. Tomorrow: Learn from Ford “Moon” Mullen of the 1944 Phillies, who went from infield to classroom.